Under President Moon Jae-in’s administration, South Korea is proactively drawing North Korea out of diplomatic isolation and onto the path of international engagement. From facilitating North Korean participation in the 2018 Pyeongchang Winter Olympics to conveying Pyongyang’s commitment to denuclearisation at the United Nations General Assembly, South Korea hopes to establish permanent peace on a denuclearised Korean Peninsula. If the strength of bilateral ties are gauged by the number of meetings between leaders, then relations between North and South Korea were rosy beyond measure in 2018. Moon and Chairman Kim Jong-un met three times within a single year, and there are expectations for a fourth summit. While the current level of dialogue between North and South Korea is unprecedented, Seoul’s efforts in reaching out to Pyongyang are not without challenges. South Korea must navigate the hurdles posed by broader regional dynamics and Pyongyang’s major power relations. South Korea’s position on the issue is made more difficult by its power disparity with regional neighbours and the United States, all of whom want to protect their own interests on the Peninsula. South Korea’s recent engagement with its northern neighbour reflects two tenets of its middle power diplomacy. First, given that South Korea’s main security challenge continues to stem from instability on the Korean Peninsula, the Moon administration is employing an approach that seeks to maximise Seoul’s diplomatic influence. For middle powers like South Korea, niche diplomacy is particularly important — it is about focussing their limited resources and attention on a specific matter critical to their interests. Considering that the North Korea nuclear issue has a global security dimension, South Korea’s efforts to make the world a safer place in this area also bolsters its own international standing. South Korea’s middle power diplomacy leans towards a functional strategy that is premised on managing the North Korea challenge. This is contrasted against a normative strategy, which sees middle powers focussing more on establishing broad behavioural standards and norms in the region. While the two strategies are not necessarily mutually exclusive, such a typology of middle power behaviour points to how differences in levels of resources and threat perceptions can shape the foreign policies of regional middle powers. Second, South Korea may have seized the initiative to engage North Korea, but its efforts still require the support of major powers such as China and the United States — both of which have their own stakes in the development of the issue. Because of this, Seoul has conducted briefings with Beijing and Washington following its meetings with Pyongyang to keep them updated on developments. Moon has also stressed that South Korea still needs to work closely with the United States on its North Korea strategy. In this regard, South Korea aims to balance its alliance ties with a more conciliatory approach towards inter-Korean relations. The Moon government also assumes a mediating role between North Korea and the United States. It was South Korean National Security Advisor Chung Eui-yong who, back in March 2018, relayed to White House officials Kim’s eagerness to meet with US President Donald Trump as soon as possible. And when Trump called off the US–North Korea Summit planned for June, Moon promptly sent officials to Washington and held a surprise meeting with Kim in the demilitarised zone. Two days after the Moon–Kim meeting, the Trump–Kim summit was back on track. This is not to overplay South Korea’s influence on the issue. Without US and North Korean willingness to negotiate, there would be little that Seoul could do. Moon himself has acknowledged that US–North Korea denuclearisation talks are not a matter on which South Korea can take the lead. South Korea’s role is rather that of a facilitator and mediator. Its value lies in shaping a conducive environment for North Korea and the United States to hold discussions. This is reflective of middle power roles in most regional and global issues — rather than being the single most influential player, middle powers help to lay the groundwork for action. Ultimately, whether South Korea can achieve its desired outcomes on the Korean Peninsula depends on its ability to seize the opportunities offered by the prevailing circumstances. That South Korea was able to conduct middle power diplomacy on the issue in 2018 was thanks to a fortuitous culmination of factors. 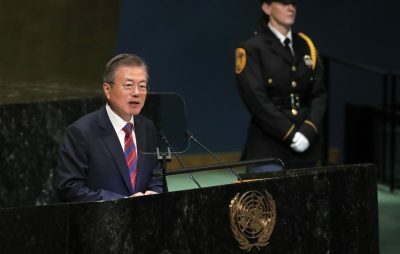 These included the presence of a more progressive government in South Korea that sought to assume ‘the driver’s seat’ in the North Korea issue and open dialogue with Pyongyang, the pragmatic policy of the Trump administration towards North Korea and Kim’s pledge for dialogue with the South in his 2018 New Year’s message. While there may still be a long way to go before concrete agreement on denuclearisation occurs, South Korea’s prolific diplomacy is not only enhancing Seoul’s standing on the global stage but also contributing to a more peaceful Korean Peninsula.